Aberdeen Clean-All is a family-owned business serving North Eastern South Dakota for over 30 years. We strive to provide high quality service to our clients by assembling the right team and tools for each job. We are experienced with insurance claims, and will work with you to quickly restore the damage and get things back to normal. Aberdeen Clean-All was established in 1987 by Ken Jacobson. Ken had worked in the cleaning and restoration industry for over a decade, and creating a new business of his own had been a lifelong dream. In the early years, Aberdeen Clean-All primarily focused on residential carpets, air-duct systems, fireplaces, and chimneys. In 2008, Aberdeen Clean-All officially became a family business when Ken’s son, Kerry came aboard. Together, Ken and Kerry have made Aberdeen Clean-All Eastern South Dakota’s premier cleaning and restoration company. 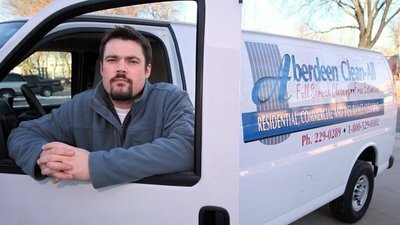 Whether you need to get your carpets and air-duct system cleaned, or have suffered a severe fire or water loss, you can trust Aberdeen Clean-All to work with you and your insurance company to mitigate the damages, reduce chaos and frustration, and return your home to its pre-loss condition. Would you like to be a part of our professional cleaning team? Get in touch!